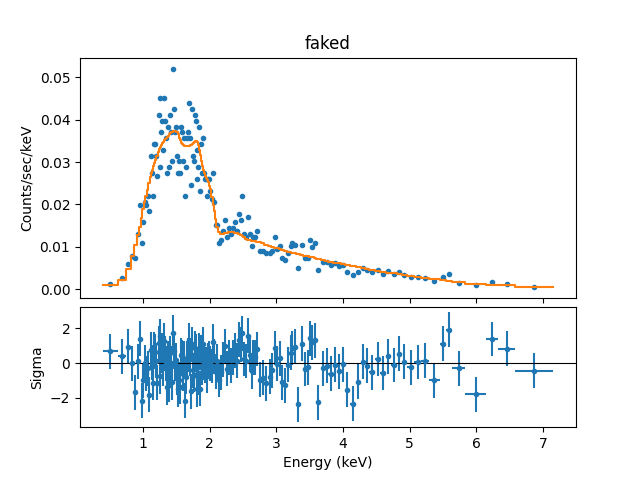 This thread illustrates the use of the Sherpa fake_pha command to simulate a spectrum of a point source obtained with the ACIS-S detector aboard Chandra, with and without consideration of a background component. In order to simulate a Chandra ACIS-S spectrum with Sherpa, we must define an instrument response with the appropriate ARF (auxiliary response function) and RMF (redistribution matrix function) files. These files may be downloaded from the Chandra Proposal Planning page of the CalDB (Calibration Database) website, where sample RMFs and corresponding ARFs positioned at the aimpoint of the ACIS-S array (and at selected off-axis points) are available. In this thread, we use the files aciss_aimpt_cy21.arf and aciss_aimpt_cy21.rmf, positioned at the default pointing for ACIS-S. The Sherpa fake_pha command calculates a 1-D spectral data set based on a defined instrument response and source model expression. 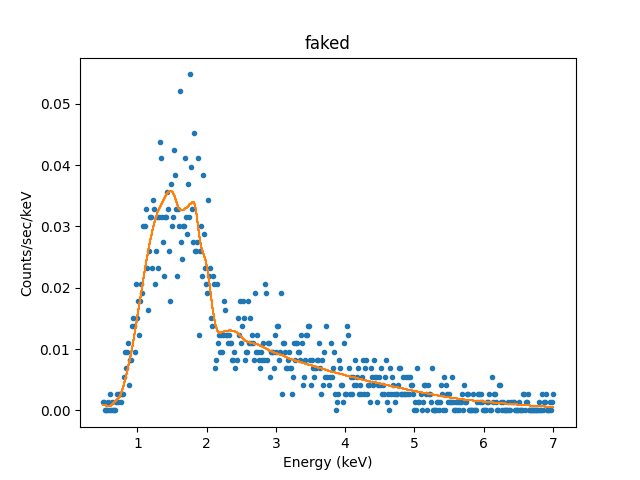 For extensive details on the fake_pha functionality, see the introductory simulation thread Simulating X-ray Spectral Data (PHA): the fake_pha command. To learn how to simulate the spectrum of a point source which includes a background component, follow the second half of this thread, "Including a background component". Here, the ARF and RMF data are loaded and assigned to a set of variables with the unpack_* commands. These variables will be used to assign the instrument response to the faked data set we will create in the next section, "Defining a Source Model Expression". Now that we have loaded the ARF and RMF instrument responses, we use the set_source command to establish a source model expression and name the faked data set which will be produced in our simulation. We have defined a source model expression for this simulation using an absorbed 1-D power-law model with a Galactic neutral hydrogen column density of 2×1021 cm-2 and a power-law photon index of 2. 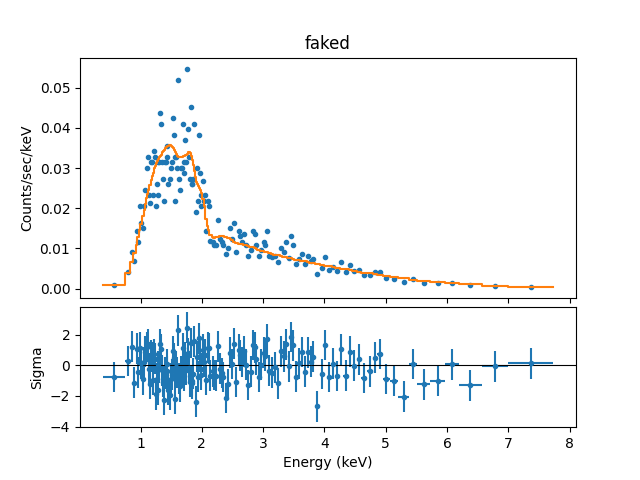 Simulating the Chandra spectrum means taking the defined model expression, folding it through the Chandra ACIS-S response, and applying Poisson noise to the counts predicted by the model. The simulation is run with fake_pha, which has four required arguments: dataset ID, ARF, RMF, and exposure time. We decide to simulate an ACIS-S spectrum resulting from a 50 ks exposure of a point source. This command associates the data ID "faked" with a simulated data set based on the assumed exposure time, instrument response, and source model expression we defined earlier; Poisson noise is added to the modeled data. To correct the flux we need to adjust the normalization, as demonstrated in the section "Defining the Model Normalization for the Simulated Data". Before we can use the simulated data set for scientific analysis, it must be re-normalized to match the flux (or total counts) required by our selected source. With the new normalization, the simulated flux is correctly set at the measured flux of 1.e-12 ergs cm-2 s-1. A plot of the data is shown in Figure 1. The resulting plot is shown in Figure 2. Next, we examine the quality of the fit with the confidence command (conf), and print the fit and confidence results with show_fit and get_conf_results, respectively. Maximum likelihood function (XSPEC style). as XSpec, use the WStat statistic. amplitudes, and D(i) is the number of observed counts, in bin i.
the number of counts in each bin. freedom, should be of order 1 for good fits. - when `truncate` is `False` an error is raised. The new fit to the grouped simulated spectrum, along with the residuals divided by the uncertainties, is shown in Figure 3. In this section, we repeat the steps above to simulate a source PHA data set, but this time, including a background component. This involves adding new Sherpa commands along the way to define settings for the background data. For the source simulation, we use an absorbed 1-D power-law model with a Galactic neutral hydrogen column density of 2×1021 cm-2 and a photon index of 2. For the background simulation, we assume a flat profile with a 1-D polynomial function. 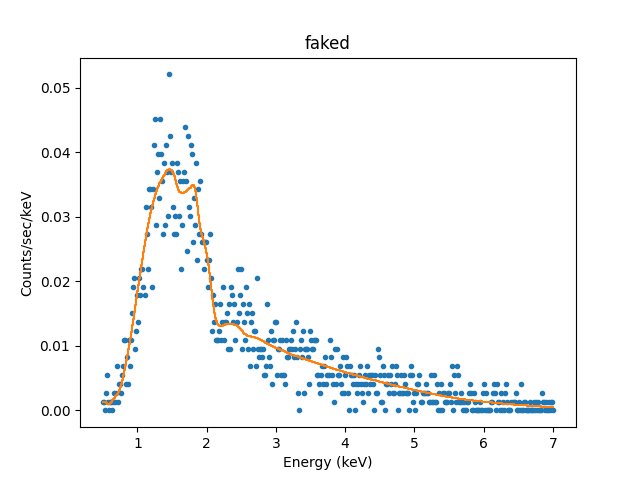 These commands associate the data IDs "faked" and "faked_bkg" with simulated source and background data sets, respectively, based on the assumed exposure times, instrument responses, and model expressions defined earlier; Poisson noise is added to the modeled data. Now, we assign the "faked_bkg" data set as the background component of the faked source data set "faked", using the set_bkg command. In the next section, we will correct the normalization of the simulated source and background data sets. The resulting plot is shown in Figure 4. The simulated source-plus-background data set ("faked") is filtered to include only the counts in the energy range 0.5 keV-7.0 keV (recalling that data set "faked" now contains the background information stored in data set "faked_bkg"; "faked_bkg" is no longer needed in the context of this thread). 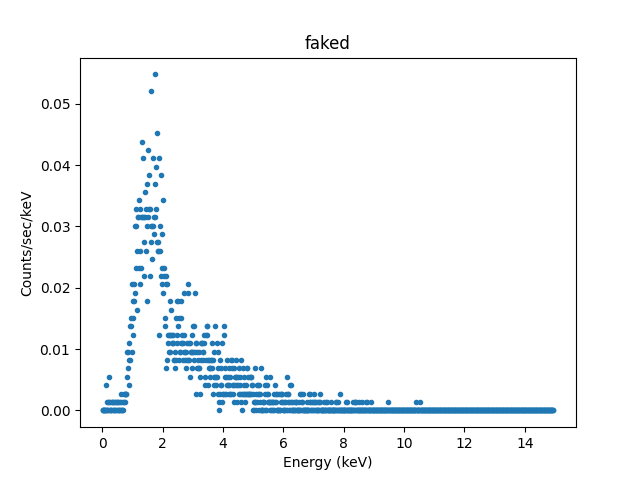 sherpa> set_bkg_model("faked", bkgA, 1)  # set model for bkg_id=1 of data set id="faked"
The resulting plot is shown in Figure 5. Now we can examine the quality of the fit with the confidence command (conf), and return the fit and confidence results with show_fit and get_conf_results, respectively. The new fit to the grouped simulated source-plus-background spectrum, along with the residuals divided by the uncertainties, is shown in Figure 6.